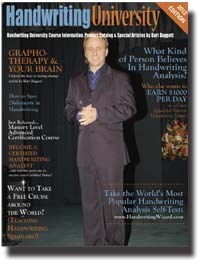 The World's Best Handwriting Analysis Training Is Now 100% Online and You Can Have Instant Access. Newsletter? It's free to sign up. and improve both business and personal relationships. Page to view all books, courses, and handwriting analysis programs for sale. If you have any questions about which of our programs will help you the most, call our office 1-310-684-3489. Ask about the unadvertised financing options, free seminar tickets, and special tele-classes for this month. 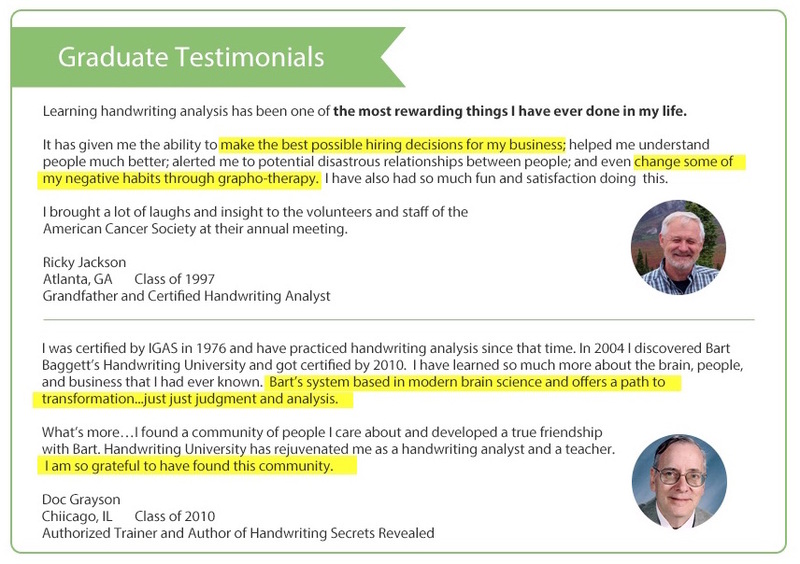 Learn to analyze Handwriting for fun and a 2nd career by enrolling now into Handwriting University's Certification Program. If you are curious about building a career or just a fascinating hobby in handwriting analysis or graphology, this site is your one-stop resource. 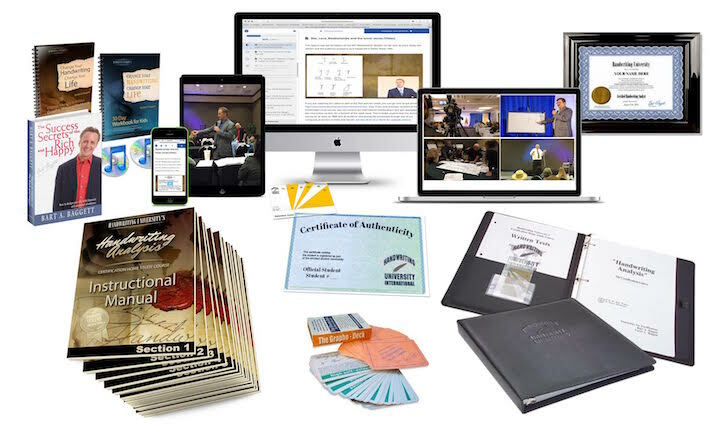 Whether you are looking for a simple free special report, an online video training course for free (level 100 is free with Basic Free Membership) or a full blown Master Level Handwriting Analysis Course (Advanced Students Only) ... Handwriting University is for you. My name is Bart Baggett. You might a have seen me on one of 1600 media interviews over the past decade including Today Show, CNN's Paula Zahn and Larry King Live, and even I love New York on VH1. I can teach you the step by step method that made me so successfuly, highly paid, and a celebrity in many circles. In fact, my handwriting analysis technique is soooo accurate, we now have trainers in Taiwan, India, South Africa, Indonesia , Australia and opening more campuses each year. I can teach you this handwriting analysis method which is so accurate, it makes most books other books look like guessing. Now, you can become a certified expert in just a few short months. Many people, like you, hear about handwriting analysis and are really entertained and interested, but you might have never stopped to ask how learning this tool can be used to improve every area of your life. We have 5 Levels of programs to choose from, depending on how serious you are about mastering this psychology of success through handwriting. Most students jump into the course in the following sequence... level 101, Certification Course, then start a business through the Authorized Mentor Training Program where we teach business and marketing skills. Call my office with any questions on which program to choose or make an appointment right now with our team. TALK TO A REAL PERSON IN THE NEXT 24 HOURS NOW. Call our office anytime with questions or talk to a local representative in your home country. Visit the Catalog Page and get enrolled now in US prices. Thank you. There is no way to fully express my gratitude for this seminar. I think it came at just the right time. I am very excited that I will be able to help people and understand myself deeply. I feel every area of my life will improve. Anyone considering taking this course, should stop considering it and DO IT! I'm thrilled in knowing I go home with so much more than ever before. Listen to what students have to say. Yes, I'm very familiar with Bart Baggett's programs since those are the ones I first studied for my certification. Because of my own experience, I can highly recommend you start with his programs. They are easy to understand and will give you an excellent basis for your study. Bart and Curtis have a friendly, open style of presenting the material. Throughout the course they also provide excellent examples of how to make your analysis understandable for the folks who hire you. In fact, I like Bart's programs so much that I offer them for sale through my website. I am making a $100 an hour reading handwriting at parties, impressing those with my highly accurate assessment of them without ever having met them before! And all my knowledge comes from Bart's books, courses, and tapes. 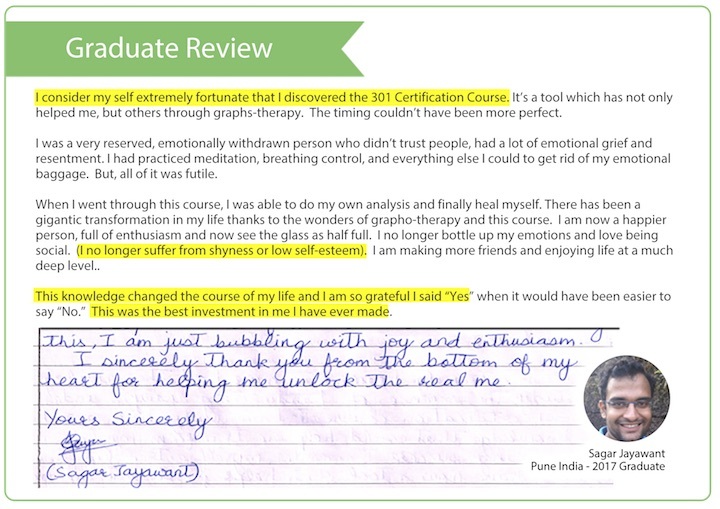 There is a great deal of depth to handwriting analysis, more than just entertainment. For those who want to really develop their knowledge of this skill, Bart Baggett's courses, without a doubt, lead the way. "Everyone NEEDS this knowledge. I'll never date or hire anyone ever again without analyzing the handwriting. This course has changed my life... and it is a hell of a lot of fun, too!" Listen to other students talk about how handwriting changed their lives!